We've told you how fast and reliable our 4G broadband services are, what a huge difference they can make to people and how quickly a property can be brought online with our 4G broadband connectivity. However, don't just take our word for it - there is no substitute for genuine real-world representative examples. 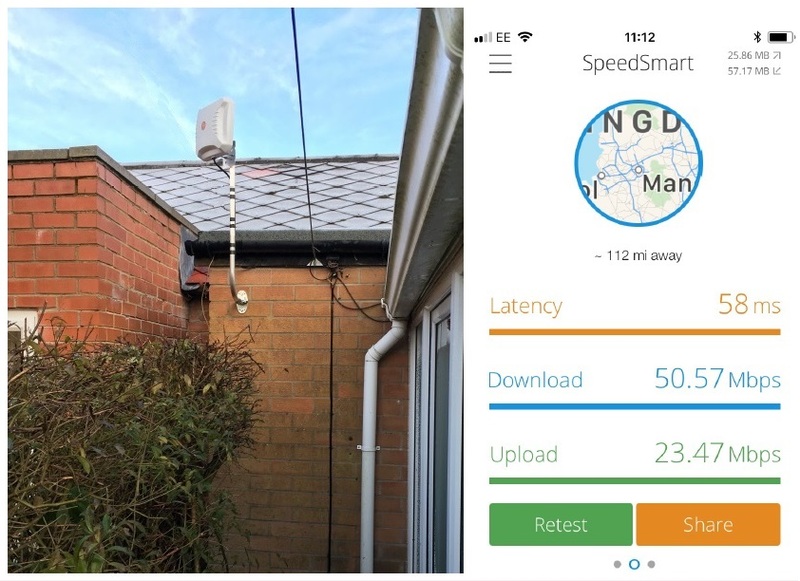 So why not take a few minutes to read about some very happy customers following just two out of our many hundreds of very successful 4G rural broadband installations. Or if you'd rather get a quick overview of what actual customers think about our services - in their own words - just click here. The customers whose experiences are detailed below both live in rural or semi-rural locations. Although neither location is truly remote, the only traditional broadband services available to them were all incredibly and nigh on unusably slow, with maximum available speeds of less than 2 Mbps. And to make matters worse, there was no prospect of any of the large terrestrial telecoms providers offering either customer - or any of their neighbours, for that matter - an improved broadband service in the foreseeable future. The above is sadly all too often an experience shared by so many home owners and small businesses in rural or remote locations who find themselves firmly and helplessly on the wrong side of the so-called "digital divide". Providing small and hard to reach rural communities with acceptably fast broadband is at the very bottom of the larger telecoms companies' priorities - simply put, because it's commercially far less rewarding than enabling areas with a much higher population density. However, help is at hand and an ideal solution is already available... as the following real-world rural broadband examples clearly show. Mrs. H lives on the outskirts of a small village in the Kent countryside. Although her property is less than 5 miles from the centre of Canterbury, the only traditional broadband services available to her were all appallingly slow, with maximum available speeds of less than 2 Mbps. Her children couldn't adequately access online materials that would have been really useful for their schoolwork or make use of social media to stay in contact with their friends. In summary, the family was shut out from all but the most basic of day to day internet activities that so many others nowadays take for granted. Fortunately, Mrs. H came across our 4G Internet website and there found out about the availability of government subsidy schemes specifically created for people in her situation to help subsidise the cost of getting an acceptably fast rural broadband service. She called us up, we checked that her location was within coverage of our 4G services (it was perfect for Vodafone) and we then talked with her about the quick and easy process of applying for a BDUK Better Broadband scheme subsidy (which she duly did via Kent County Council's scheme application webpage). Upon being approved as eligible for subsidy, Mrs. H received her BDUK Better Broadband voucher code by email on Tuesday June 13th. She got back in contact with us the next day to place her order for our 4G broadband service, choosing a monthly plan that suited her and her family's broadband needs. We despatched the equipment to Mrs H the same day and arranged for one of our professional installers to visit her property first thing on Tuesday June 21st. 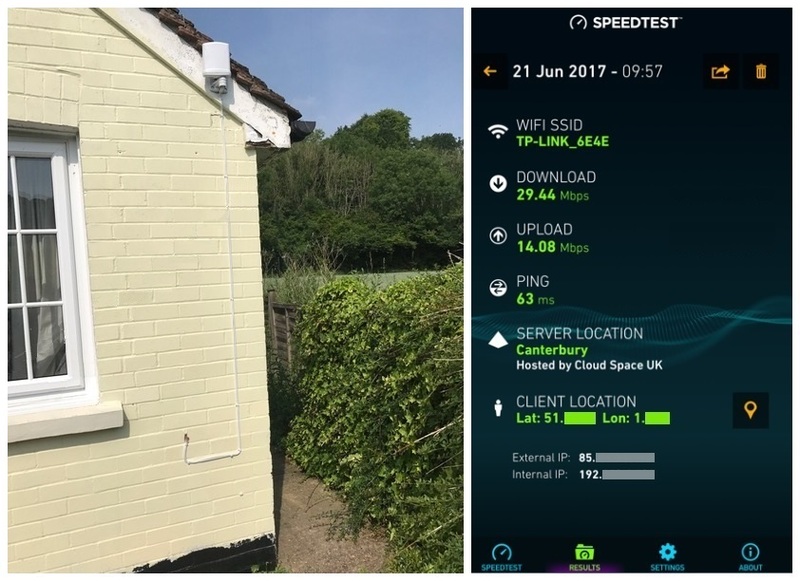 Installation and set up was completed in less than an hour, with a small and unobtrusive external 4G antenna being fixed to a suitable wall and cabled up to the internal 4G modem/WiFi router also supplied by us. Our 4G service immediately went live at her property - so the whole process only took one week from the date of her placing her order! Even better - the post-installation speed test demonstrated that Mrs H's property was instantly getting broadband speeds of over 29 Mbps download and over 14 Mbps upload... that's over 15 times the speeds that she was previously getting! We ourselves always err on the side of caution and only quote typical speeds of 20 Mbps download and 10 Mbps upload for our 4G rural broadband solutions - although improving all the time, these are the average 4G speeds that can be expected across the UK, as independently verified here. However as you can see, at Mrs. H's location, actual speeds achieved were noticeably faster! And because she had a BDUK Better Broadband voucher code, the entire costs of our supplying, installing and setting up her equipment and service were fully covered! 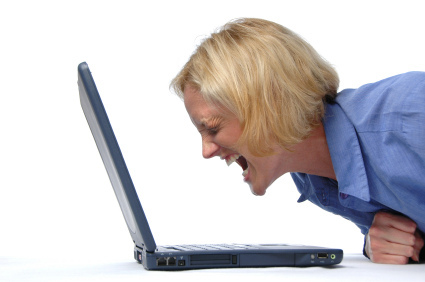 The only thing that Mrs H needs to pay is the ongoing monthly charge for her chosen 4G broadband plan! So Mrs. H and her family are now all delightedly using their new fast and robust 4G broadband service, which we supplied, installed and set up absolutely free of charge - including WiFi capability - and best of all, in only one week! Mrs. J lives a small rural community in the Northumberland countryside. Although her home is less than 15 miles from the centre of Newcastle, again the only traditional broadband services available to her in her rural location were all effectively unusably slow, with maximum available speeds below 2 Mbps. This again meant that Mrs. J was unable to work efficiently or reliably from home when she needed to, something that was particularly important, given that she holds a senior position in local government. Equally, she was almost entirely prevented from benefiting from all but the most basic of day to day internet activities that so many of us take for granted these days. Given her role in local government, Mrs. J was already aware of the availability of government subsidy schemes specifically created for people in her situation to help subsidise the cost of getting an acceptably fast broadband service. So she too got in contact with us, we again checked that her location was within coverage of our 4G services (it had excellent coverage from EE) and we then helped her apply for a BDUK Better Broadband Scheme subsidy (which she duly did at the very end of November via the quick and easy form on the iNorthumberland local authority website). Mrs J had her subsidy approved within a week and received her BDUK Better Broadband voucher code by email on December 4th. Upon receipt, she got straight back in touch with our experienced, friendly and helpful sales team, who talked over our various 4G monthly broadband plans with her, helping her identify the plan most suited to her personal broadband needs. Mrs J confirmed her order with us the next day on December 5th. We despatched the equipment to Mrs J the same day, but given the imminent Christmas break and Mrs J's own availability over this period, the earliest suitable date for an installation at her property turned out to be just into the New Year on January 5th, when one of our professional installers visited her property. Installation and set up was again completed in less than an hour, with a small and unobtrusive high-gain 4G antenna being sited at a suitable external location and then cabled up to the internal 4G modem/WiFi router also supplied by us. Again our 4G service went live at her property immediately following installation - so the whole process only took four weeks from the date of her placing her order - and that's even taking into account the Xmas break! The mandatory post-installation speed test demonstrated that Mrs J's property was instantly getting 4G broadband speeds of over 50 Mbps download and over 23 Mbps upload... that's more than 25 times the speeds that she was previously getting! We ourselves always err on the side of caution and only quote typical speeds of 20 Mbps download and 10 Mbps upload for our 4G rural broadband services - although improving all the time, these are the average 4G speeds that can be expected across the UK, as independently verified here. However as you can see, at Mrs. J's location, actual speeds achieved were again noticeably faster! And because she had a BDUK Better Broadband voucher code, the entire costs of our supplying, installing and setting up her equipment and service were fully covered! So again, the only thing that Mrs J needs to pay is the ongoing monthly charge for her chosen 4G broadband package! So Mrs. J is now also delightedly using her new fast and robust 4G broadband, which we supplied, installed and set up absolutely free of charge - including full WiFi capability throughout her property. Needless to say, she has already made a point of telling all her neighbours about her new 4G broadband service, how quickly and easily it was installed, how well it performs, what a difference it is already making to her - and of course, because of her property's eligibility for a BDUK Better Broadband subsidy, how full supply, set up and installation of the required 4G equipment cost her precisely nothing at all! Find out today if we can do the same for you!